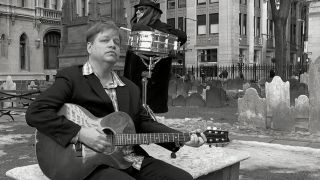 New York-based singer and guitarist Phil Gammage honed his craft in post-punk outfit Certain General before embarking on a solo career, issuing such landmark albums as 1990’s Night Train and the following year’s Kneel To The Rising Sun. He founded Adventures In Bluesland as an acoustic trio in late 2013. The group’s current line-up is completed by lap steel guitarist Don Fiorino, bassist Johnny Cement, saxist and keyboardist Robert Aaron and drummer Kevin Tooley. How did you start playing guitar and what drew you to the blues? Blues was the first style of music I began to play growing up in Houston, Texas. When I started out, the punk rock thing was still happening and me being the opportunist that I am [laughs], I fell into it quite easily. I began writing my own songs and they appeared as these bluesy tunes. They just came out of me, and they still do. Playing blues works for me on so many different levels. Great blues music can express something very special and primal while evoking a deep vibe for whoever plays and listens to it. You’ve got a certain freedom playing blues that you may not find playing other styles of music. Tell us about some of the tracks on The American Dream. Creepy In The Woods revolves around the Pentecostal church and some of their worship activities: speaking in tongues, drinking poison, handling poisonous snakes, those kind of things. Drifting uses a guitar idea called ‘sliding ninths’ that blues players like Magic Sam often used. Booze, Blues, And New Tattoos is a boogie. But my lyrics are almost always fiction. I view my songs as mini-novellas. What inspired the cover versions? I’m a huge fan of haunting blues songs from the 1920s and 30s. On The American Dream I recorded a couple that were part of my live repertoire: Blind Lemon Jefferson’s One Kind Favor, aka See That My Grave Is Kept Clean, and Geeshie Wiley’s Last Kind Words, which Kevin thought sounded so great with just me playing guitar and singing that he mixed it with no overdubs. Outside Adventures In Bluesland, what have you been up to? I perform with a couple of different ensembles – Adventures In Bluesland and also a smaller quartet. I’ve recently returned to playing solo acoustic shows too and I occasionally participate in Nashville-style songwriter circles, which are always fun.